Isaiah Thornton Montgomery was born into slavery on 21 May 1847 on the Davis Bend Plantation in Warren County to Benjamin Thornton Montgomery and Mary Lewis Montgomery. The younger Montgomery played a leading role in the history of Mound Bayou and in Mississippi’s business and political history. Groomed for success at an early age by his father, who even in slavery essentially ran the Davis Bend plantation, Isaiah Montgomery experienced the watershed moment in his life at age ten, when he was sent to the master’s quarters to serve as personal servant to Joseph E. Davis, the plantation’s founder and older brother of Jefferson Davis. Joseph Davis, who modeled his considerably liberalized methods of plantation governance on theories first espoused by British industrialist-philanthropist Robert Owen, initially used Montgomery for basic services. By the time the young man turned twelve, he had become Davis’s personal secretary, certainly one of the most important and influential positions available to a plantation slave. In addition to his clerical duties, which included filing and supervising Davis’s business appointments, Montgomery was in charge of the vast array of Davis’s business and personal correspondence. In this capacity, Montgomery is thought to have honed his reading and writing skills while receiving a most extensive education in business. He also received free and unfettered access to Davis’s well-stocked library. During the Civil War, while his family sought refuge in Cincinnati, Ohio, Isaiah Montgomery served for a brief time as a cabin boy under Union admiral David O. Porter before rejoining his family near the end of the conflict. When the Montgomerys returned to Davis Bend after the war, they found it under Union control and in danger of being confiscated, a condition that helped convince the exiled Davis to sell the property to Benjamin Montgomery. For the better part of the next decade, the Montgomery-owned Davis Bend operation was the third-largest cotton concern in the state. Following the collapse of the cotton market in the aftermath of Reconstruction and his father’s death in 1877, Isaiah Montgomery ascended to the role of head of the Montgomery family, but with the plantation business in ruins, the Montgomerys found their financial situation bleak. A good portion of their money had fled to Kansas in the form of sharecroppers who had left Davis Bend long before settling their debts. Montgomery, desperate to explore any avenue of future profits, tried to reorganize many of these Kansas-bound Exodusters in a Davis Bend–type colony, but the venture was short-lived and financially unsuccessful. With growing concern over his family’s financial future, Montgomery settled in Vicksburg and opened a small mercantile business while biding his time looking for the next big venture. 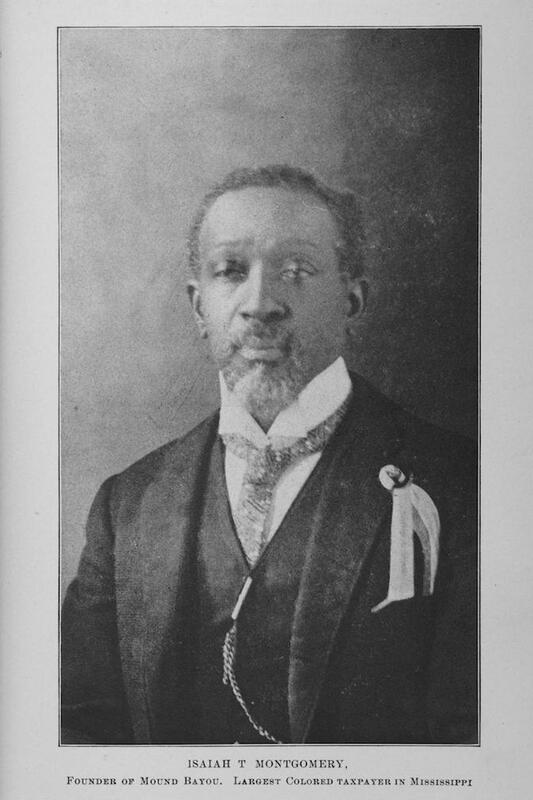 When he was contacted by a land agent of the Louisville, New Orleans, and Texas Railroad during the summer of 1887, he and his cousins, Benjamin T. Green and Joshua P. T. Montgomery, collaborated on an extensive entrepreneurial project that culminated in the founding of Mound Bayou, the Mississippi Delta’s first African American town. Mound Bayou became a booming center of African American economic and social life. While Davis Bend and Mound Bayou tend to dominate his legacy, Isaiah Montgomery’s more controversial political legacy involves his role in the 1890 state constitutional convention, where he was the lone black delegate. On 12 August he stood before the other delegates and supported the measures that effectively disfranchised nearly every African American voter in Mississippi as well as more than 111,000 landless white voters. Scholars still struggle to understand his decision, but as a businessman, Montgomery faced enormous pressure to maintain a relationship within the state’s predominantly white political and economic leaders. Thus, by offering to speak on behalf of a measure that was sure to pass with or without his support, Montgomery placated fellow planters while steering clear of the sort of controversy certain to place him at odds with the state’s power brokers. Against the backdrop of his relationship to Booker T. Washington, who espoused independence based on self-reliance and economic autonomy rather than political tactics, Montgomery’s controversial role in the convention seems easier to comprehend. He died on 6 March 1924.